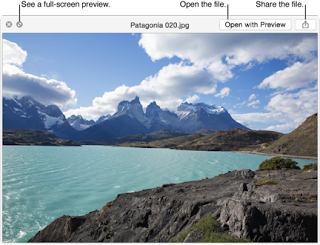 How to view photos from SD card on Mac Pro in slideshow mode without having to download photos into iphoto? This is not a difficult task. You need a software for it known as Quicklook. 1. Manually enlarge the window: Drag its corners. 2. See the item in full-screen view: Click the Full Screen button on the left. To return to the standard view, click the Exit Full Screen button . 3. See the next or previous item: Click the arrows on the left, or press the Left and Right arrow keys. In full-screen view, you can click Play to view the items as a slideshow. 4. See the items in an index sheet view: Click the Sheet View button on the left, or press Command (⌘)-Return. 5. Open the item: Click Open with [App]. 6. Share the item: Click the Share button on the right. When you’re done, close the Quick Look window: Press the Space bar, force click again, or by click the Close button .